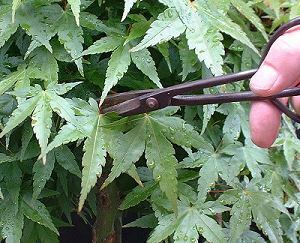 Defoliating or leaf-cutting is a technique that involves removing the leaves of deciduous and broadleaf bonsai during the Summer; it forces the bonsai to produce a replacement set of leaves in a second 'false' Spring flush of growth. This replacement set of leaves results in increased ramification and leaf density, a reduction in leaf size and internode length and finally, superior Autumn colours. Many enthusiasts first try defoliating on trees that are not horticulturally and/or aesthetically ready for defoliation. Before describing defoliating techniques in detail, it is worth highlighting the need for trees to be healthy and vigorous before leaf-cutting is carried out. 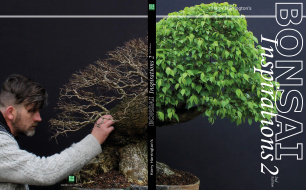 The removal of the leaves from a tree is debilitating and will temporarily weaken any bonsai; defoliating should only ever be carried out on vigorous specimens that will be able to recover from the process. Trees that are showing signs of weak growth, whether it be due to recent repotting, disease, styling or recent hard pruning, are not suitable for defoliating. 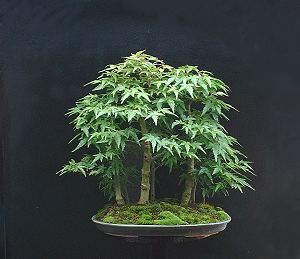 Be aware that defoliating can be so taxing on a bonsai that failure to respond can occur if the tree is not vigorous; parts of the branch system can be weakened to the point that they die-back. 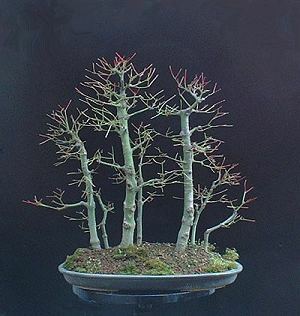 Defoliating is also a technique intended for 'finished' bonsai only; a tree intended for defoliation will have the trunk, primary, secondary and tertiary branches established. Defoliating a tree that requires branch or trunk building will slow down development of these parts greatly. Different tree species react in a variety of ways to defoliating; some respond quickly and strongly to total defoliation (to the extent that they can be defoliated more than once a year) while with other species it is preferable to only partially defoliate. The most common way to defoliate a tree is to remove each and every leaf with scissors, leaving the leaf-stalk or petiole behind. The remaining petioles nourish the tree as new buds contained within the leaf-axils begin to extend and open out. As the new leaves start to open out, the petioles dry out and fall away from the branches. After defoliating a tree, leave it in good light to stimulate stronger budding, particularly from inner and lower branches. Without leaves, a defoliated bonsai will require less watering. The new leaves start to emerge 3-6 weeks after defoliation (depending on the exact timing, tree vigour and tree species) and are smaller and more numerous. Vigorous trees will also back bud as a result of defoliation. The exact timing of defoliation differs from one tree species to another. As a very general guideline, leaf-cutting can be carried out after the spring flush of growth has hardened off (the leaves lose their spring colour and become more 'leathery'). For more detailed timing notes please see the specific species guide later in this article. Immediately after total defoliation, the tree is bare for the first time since Spring and it is possible to study the branch structure; this is an ideal time to prune, wire and style a deciduous tree.